Rainwater is a plant�s preferred water source. For folks living in arid and semi-arid climates, collecting rainwater saves or reduces the pumping of well water. For those who live in temperate areas of (mostly) adequate rainfall, collecting rainwater can tide you over during dry spells and is a hedge against drought. For everyone, using collected water in conjunction with a drip irrigation system delivers water directly to the plant, thereby using less water to greater effect. By keeping certain plants� (i.e., tomatoes) foliage dry, you lessen the risk of disease. If you also collect water from the front glazing wall into a stock tank, you can use a watering can to water seed beds or rinse aphids off a plant. This above ground cistern captures the rainwater off the roof of the greenhouse. It is insulated with Rastra � Block and will be stuccoed. The water is gravity fed directly through to the interior of the building via an insulated hose connnection. How much water will the greenhouse collect? Every building has a "footprint", which is equal to the square footage of its outside dimension s(leaving overhangs out of the calculations). One cubic foot of water contains 7.43 gallons of water. Since Taos County, NM (USA) precipitation is approximately 12 inches per year, then one cubic foot of water falls on each square foot of the entire greenhouse. The 3,830 gallons of water that falls on this greenhouse here in the high desert of northern New Mexico is a lot of water in a semi-arid situation. Some of this water will be lost to evaporation and snow that doesn�t get captured by the gutters. But even if we subtract 25 percent as loss, that leaves 2,873 gallons of water. Obviously, with the potential for large amounts of water collected in areas with higher rainfall, you will want to have a way to divert water away from the cistern when it becomes full, as well as an overflow pipe from this stock tank if you use one. 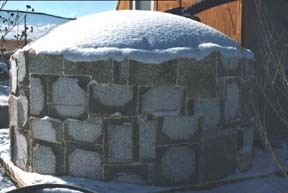 In sizing a cistern, or above ground holding tank for water, the basic rule is that the capacity of the storage tank should be (in semi-arid areas) one-third the total gallons of precipitation, or (in arid areas like low desert) half the total gallons, since it can be a long time between rains or rainy periods. I chose a 1,225 gallon cistern that will save about 40 percent of the water that I will probably capture, or about 30 percent of total precipitation. For those of you who live rurally in unelectrified areas, you can use a larger cistern and/or capture water off other buildings. Another option would be to bury the cistern and use a solar or hand pump to deliver the water into the greenhouse. 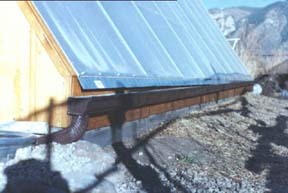 One long continuous gutter collects water off the glazing wall and delivers it to a 120 gallon stock tank. In sizing the stock tank, I decided to use one that holds about 120 gallons of water, since we don�t usually receive more than one-half inch of rainfall at a time. For areas with more or heavier rains, there are a variety of larger sizes available, depending upon your room to place the tank and your budget. Incorporating an overflow pipe (directed towards a growing bed) will remove excess water. The stock tank should be screened and/or covered with a lid to keep wind-blown debris and drowned animals from collecting. It can also be insulated depending upon the severity of winter temperatures. Water is delivered to the plants from a hose that is attached to an insulated spigot at the bottom of the cistern. The entire storage tank is slightly elevated in relation to the level of the interior beds, and would have been placed a foot higher, except that I plan to attach a shed onto part of the rear well of the greenhouse and want to capture all that extra roof water. Raising the whole cistern another foot would significantly increase the water pressure. Even situated as is, the cistern provides enough water pressure to successfully employ a 25 foot long, half-inch diameter soaker hose, which conserves water usage. There is also a complete drip irrigation system using T-tape that will be tested this fall. I have been using some well water to augment the cistern/stock tank (from October 1st through June 15th we�ve had only 4.3 inches of rain! ), and will continue to water from the well if the stock tank runs dry. I want to let the cistern collect all the water from the summer rains. Then during the winter, rather than contend with freezing hoses and icky weather, I can use the collected rainwater (kept above 32 degrees F in the insulated cistern) to meet my water needs all winter long.